In Atlantis blue metallic with Denim twill seats. 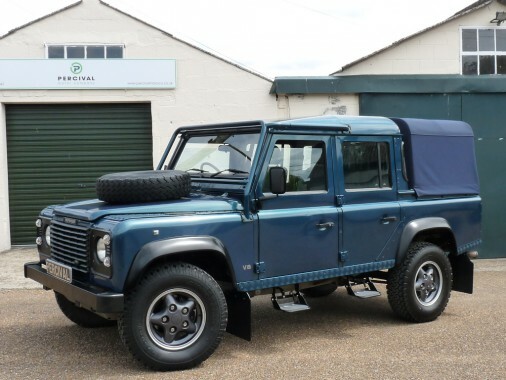 This Defender double cab has a factory 3.9 litre EFi V8 petrol engine with a five speed gearbox and was built by Foleys in Essex on a galvanised 110 chassis using a genuine 1998 Anniversary (No. GB 054) as a starting base. It was used as a school run machine and then purchased by a Land Rover enthusiast who asked Foleys to replace the tired interior from top to toe and convert the gearbox to a five speed manual from the orginal three speed automatic. Foleys maintained the car for years and did the conversion for the second owners who needed more room than the 90 could provide. It has covered 100,000 miles and is in excellent order.